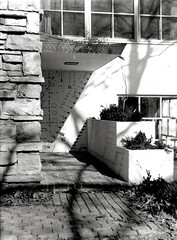 A relatively early photograph depicting the entry to the home. The image was taken at the particular time of the day when the angle of the sun aligns with the angle of the slot between the roof overhang and the planter below. This slot is demarcated by decorative tiles set into the stucco wall. The copper fascia and gutter at the overhang collects water which is removed via a copper gargoyle. Armstrong fashioned a kind of serpent's head out of the end of some copper pipe. Shrubs and vines are just beginning to establish themselves in the built-in planters. It appears that the photograph was taken within a year or two following the initial construction in 1938.